The Dublin city centre building was taken over and repurposed as a homeless hostel. It follows the release of a statement from the receivers earlier today in response to the occupation of the Dublin building late last week by a group of activists who have set up a temporary hostel for the homeless. The statement from Tom O’Brien of Mazars calls on the group behind the effort, Home Sweet Home, “to immediately end the current occupation in the best interests of those who are staying there”. It said that the receivers had tried several times to meet with the group, to no avail, and warned that if cooperation was not immediately forthcoming, “we have no option but to take the only responsible course available and look for assistance from the court”. Rossa Fanning SC, for the receivers, told the High Court this afternoon that due to the occupation the building, which has been vacant since mid-2015, it no longer has fire insurance and that its public liability insurance will lapse on in mid-January unless the receivers are able to regain possession. They also say that there are a number of serious health and safety risks that make the building unsuitable for use as a shelter. The former office block, they say was never intended to be used for residential purposes and required extensive maintenance. They have particular concerns over the electricity supply which had been cut and was restored by the occupiers. There was also a risk of people tripping and falling down stairwells in the building, there were concerns about the building’s water supply and there is no provision for the removal of waste. Justice Paul Gilligan granted lawyers for the receivers permission to serve short notice of the injunction proceedings on solicitors purported representing the occupiers. Noting health and safety concerns, he made the matter returnable for tomorrow morning. Should the court grant the injunctions sought, the joint receivers, Fanning continued, were also prepared to accept a timeline from the court for the occupiers to leave the building. Responding to the news this afternoon outside Apollo House, activist Rosi Leonard said they would be consulting with their legal team before deciding how to respond. Speaking after a free concert at the building by Glen Hansard and others, attended by hundreds of people, she said that the attendance showed there was huge public support for the project and others like it. Leonard said that there appeared to be an effort to paint the activists as irresponsible, but argued that it was the government that was being irresponsible by choosing to leave buildings vacant while people were sleeping rough on the streets. Activists with the group – which is supported by well-known figures like Hansard, Damien Dempsey and film director Jim Sheridan – moved into the building late on Thursday night. Today’s statement from Mazars, the receivers appointed by Nama, said “our immediate priority and concern has been the health and safety of the homeless people seeking shelter there”. While we endorse the importance of highlighting the need for providing shelter to the homeless and the most vulnerable in society, the provision of such sheltered accommodation must be done in an organised, structured and sustainable manner. That is not possible in Apollo House. “We immediately engaged with Dublin City Council and homeless charities who provide shelter and care to the homeless with a view to ensuring that appropriate alternative accommodation, with the necessary facilities and staff, would be available to those who might seek shelter in Apollo House. The statement said that Apollo House is a commercial premises which was closed down in 2015 due to its poor condition, pending redevelopment. “We share the views of the homeless agencies that the building is completely unsuitable for residential use and lacks the most basic facilities needed by those who are homeless. Notwithstanding the efforts by Home Sweet Home to provide these basic facilities, the building simply does not meet the requirements for a sustainable, safe physical and caring environment. Another very significant issue is that this illegal occupation of Apollo House has resulted in the loss of fire insurance cover for the building which poses an immediate and significant risk to the occupants and to neighbouring property and occupiers. As the Receivers to Apollo House we cannot responsibly allow this situation to remain. The statement said that Dublin City Council had confirmed they expect 210 new beds to become available this week in three city centre facilities. “These facilities are run by homeless agencies who provide not just beds but a full professional support service comprising professional care, medical and counselling staff along with access to public health nurses. Dublin City Council has agreed to work with these housing agencies so that all those sheltering in Apollo House can be accommodated in these facilities. “Our overriding concern is for the health and safety of those who are homeless currently staying in Apollo House. The Receivers have tried to meet with Home Sweet Home in order to organise a move of those in Apollo House to appropriate accommodation with the full support services provided. We call on those behind Home Sweet Home to act responsibly and work with Dublin City Council to immediately end the current occupation in the best interests of those who are staying there. “We have tried to engage constructively with those involved and have on a number of occasions sought to meet with them but to date, Home Sweet Home have not made themselves available to meet with us. 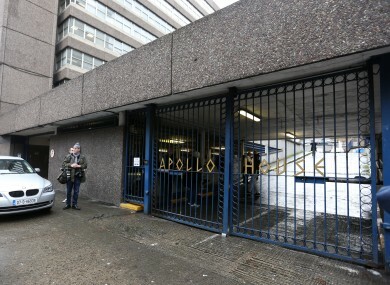 The situation at Apollo House cannot be allowed to continue indefinitely for the reasons mentioned. In the event that cooperation is not immediately forthcoming, as the Receivers to Apollo House we have no option but to take the only responsible course available and look for assistance from the courts in seeking to resolve this issue in the best interests of those currently in occupation at Apollo House. The 210 bed places referenced in the Mazars statement are at hostels at Ellis Quay, Little Britain Street and Francis Street in Dublin city centre. A judge lifted a stay on the Francis Street Emergency Accommodation unit, at Carmen Hall, last week, and Housing Minister Simon Coveney said in a statement that works were being completed with a view to having the building occupied before Christmas. The hostels at Ellis Quay and Little Britain Street have been open since 9 December. Dublin City Council confirmed this afternoon that the Carmen Hall hostel would not be open until Thursday. The twice-yearly Dublin Region Homeless Executive rough sleeper count recorded 142 people sleeping rough in the city area on the night of 22 November. CEO of Dublin Simon Sam McGuinness said on Friday that emergency beds that had already been opened for the Christmas period were already nearing capacity. The charity’s own rough sleeper count found that over 100 people were still bedding down in the streets or in public parks. Email “Receivers to Apollo House launch court action to regain possession of building”. Feedback on “Receivers to Apollo House launch court action to regain possession of building”.